The CAC111D.BA0850 TAG Heuer Formula 1 Chronotimer men’s watch is a strong and sleek watch. Part of action-designed Formula 1 collection, the Chronotimer exemplifies the rugged yet sophisticated nature of the collection. Made in Switzerland, the TAG Heuer Formula 1 Chronotimer features a stainless steel case and bezel. It comes with either a 7 in (17.8 cm) steel bracelet or a colored rubber strap. The case measures 1.61 in (44 mm) and the dial features luminescent hour-markers and hands. While the watch displays no date, the current time is prominently displayed in bold digital numbers along the dial’s lower curve. Water resistant to 200 meters (656 feet), the Chronotimer features a precise Swiss quartz movement, scratch resistant sapphire crystal, steel unidirectional bezel, and double seal screw in crown. It also has engraved dive time markers and easy-to-grip oversized flutes. 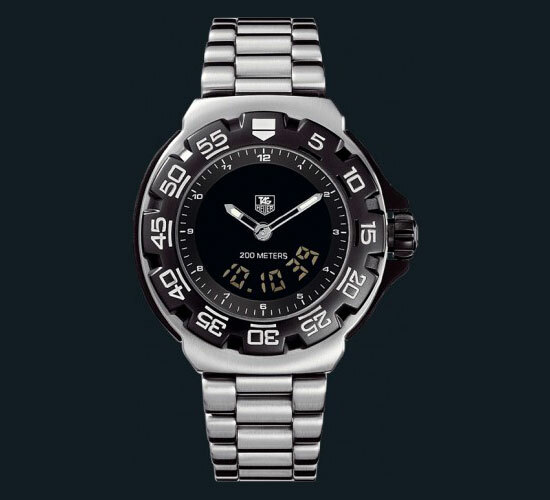 This watch demonstrates the relaxed and sporty image of TAG Heuer’s Formula 1 series. While its stainless steel construction makes it a great watch for outdoor activities, its silver and black design makes it an ideal watch for any event the night may bring. As proof to the collection’s moniker, the Chronomiter is the watch of choice for Formula 1 racer Kimi Räikkönen. Can you send me a brochure of this watch including the price. Thanks.